It starts out looking like an ad for Alpine cigarettes circa 1974: a cool dude picks up his chicky babe in a white convertible and they fang it to the country, stopping to light another smoke and let a flock of sheep pass. Then it all goes terribly wrong as their Datsun1600 careers off the road and rolls into a scenic yet deadly valley. Nestled at the bottom is the picturesque town of Paris (in reality the little goldmining town of Sofala, NSW), a backwater place that attracts these sorts of accidents at an alarming rate. 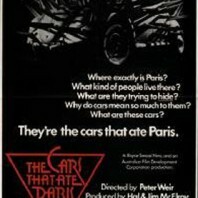 When Arthur Waldo (Terry Camilleri) survives one such crash he is taken in by the Mayor (John Meillon) and his strangely passive wife (Melissa Jaffa) and after submitting to some confronting tests by the local doctor (Kevin Miles) is deemed sick enough to stay in Paris indefinitely. First they give him a job working in the hospital with other less fortunate survivors. These, as the chipper Darryl (Chris Haywood) points out are ‘the vegies’, both fully fledged and partial. The doctor is prone to take a power drill to these poor specimens. The rest of each wreckage is left for the other townsfolk to pick over. 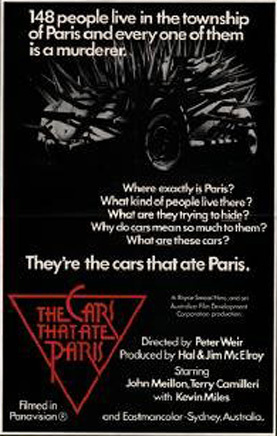 It’s all part of the car cult that has Paris is its thrall. But Darryl and the other young hoons are revving to burn rubber out of there in their hotted up vehicles, chief among these is a spiky silver VW Beetle that looks like it’s auditioning for Mad Max. In fact Peter Weir’s second feature film is a kooky precursor to Mad Max and while it doesn’t have quite the same menace the resonances are definitely there. The DVD comes with another early Weir film The Plumber starring Judy Morris as an anthropologist besieged by an uninvited tradesman. Both films press buttons on the psychological Richter scale and reveal Weir’s slow burn approach to filmmaking, perfected in works like The Truman Show and Witness. They may have their clunky moments but they also have some classic ones and you certainly wont forget them in a hurry.